Witchcraft Academy is a NetEnt slot game that comes equipped with five reels and twenty paylines. It is playable on a diverse list of devices, and in keeping with the name is all about magic and witchcraft. It has bonus features that makes possible wins of up to 200x of the initial stake and a free spins mode that makes possible wins of up to 800x of the stake. As to what else Witchcraft Academy has to keep you riveted, read on and find out. Witchcraft Academy is a five reel and four-row slot, with a total of twenty fixed paylines and has bets that range from 20p to £200. It is set in a somewhat scary and ancient school of magic that’s chock-full of spells and secrets and features enough bonuses to make Harry Potter himself perk up and dance a jig! Graphics-wise, everything is as it should be and looks quite impressive. On the reels, you have icons like a diamond, club, spade and heart-shaped potion bottles, an owl, dragon, Earthan the wizard and Efora the witch. The wizard is, by the way, the most valuable icon and players can get 20x of their stake for landing five of him on the reels. The wild icons pop up on reels 1, 2, 4 and 5 only and when necessary replace all other icons save for the scatter. There’s also a Bonus symbol to look forward to. Should three and up of these appear on the reels the Elements Bonus feature is activated. This then lets players choose either the witch or wizard to make an Element Shot at any desired column. The Element Shot makes possible a coin win on from 10x to 100x of the total stake. Should the Element Shot manage to hit a scatter icon, the Free Spins mode is then activated. 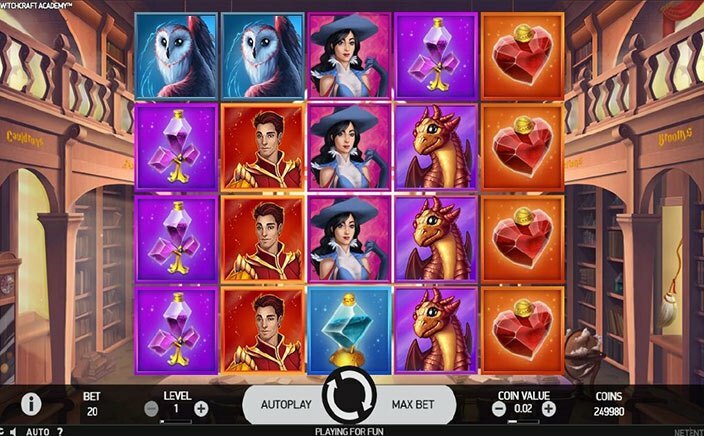 If the player is lucky enough to garner some extras, the Free Spins mode can then be played with a 2x multiplier effect and an Overlay Wild Reel. In total, 30 free spins are up for grabs, each with a 2x multiplier or 1 wild reel. This can result in wins of 800x of the stake on every free spin. 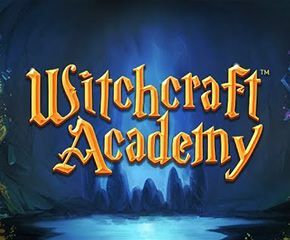 Witchcraft Academy is filled to the brim with bonuses and is an engaging, colourful and accessible slot that really hits the sweet spot and keeps players coming back for more. Overall, this medium to high variance game is well worth recommending to fans of magic.